London is the UK home of fried chicken. 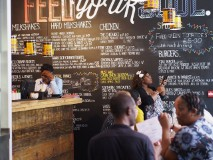 And it’s becoming increasingly common to find the soul food staple of chicken and waffles on brunch, lunch and dinner menus across the capital. Here are 5 of the best places to eat the most deliciously unhealthy fried chicken and waffles in London. Run by Virginia-born chef Bea Vo, this all-American diner serves up buttermilk fried chicken breast and thigh on top of a buttermilk crispy waffle, with a drizzling of maple syrup (£12.50). If you can still keep on eating and drinking after this fried feast, try one of the hard milkshakes – the Strawberry Blonde is blended with roasted strawberry vodka. Wow. Rita’s Bar and Dining fills a minimalist space in Dalston, packing in London hipster diners eager to sample Rita’s take on the Americana trend. The Lunch menu features a plate of fried chicken and waffles for a reasonable £11, though it’s not available on the Dinner menu. What makes this place stand out from the crowd? It’s the sides: share a main and save room for the carbolicious green chilli mac and cheese. While away a lazy London Sunday morning in this vintage Southern-style diner. Park yourself on an old railway bench, pour a bottomless filter coffee and take in the tempting brunch menu devised by Mississippi-born chef Brad McDonald. Slightly pricier than other joints, the fried chicken and waffles with maple syrup (£14) is the perfect treat after a hard working week. Sunday brunch runs from 11am until 2:30pm. The hardest decision when you visit Clutch, a chicken restaurant based just off Colombia Road, is whether to go for peppery buttermilk or soy and garlic chicken with your waffles. 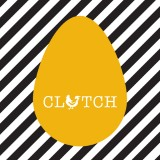 Prepared using groundnut oil, Clutch is the home of guilt free fried chicken. The Wishbone Waffles (£12) is the delicious trio of morning fried chicken, turkey bacon and bourbon syrup. When you’re feeling really lazy and just can’t be bothered to stretch your wings, Clutch does takeaway, too. Fancy something a little more up-market for brunch? Step away from the chicken and splash out on the signature dish, the Duck and Waffle: crispy waffles covered with confit duck leg and topped with a fried duck egg (£17). Pour the accompanying jug of mustard maple syrup over this most extravagant breakfast of kings and take in the London skyline on the 40th floor of Heron Tower. Bonus: it’s the highest restaurant in the UK. Read the original feature in Indigo Memoirs here.